Today I have got out of all trouble, or rather I have cast out all trouble, for it was not outside, but within and in my opinions. I had a rough couple of days this week. I've dealt with depression on and off (mostly on) since about the age of twelve. A few days ago, it came back full force. And yes, I know that technically depression needs to stick around for a couple weeks to be a medical depression, but it's so much easier to package the full continuum into a single term. Anyway, what a great test of my stoicism! Stoicism demands that I have a clear understanding of what I control and what I do not. I've mentioned before that Stoics consider even my own body as outside my complete control. That principle isn't very hard to apply to aches in my joints, but things get murkier when it comes to my emotional states. Where do emotions fall on the control spectrum? They're so closely related to the all important stoic will. Epictetus listed the things in my control as: opinion, pursuit, desire, and aversion. There's definitely an emotional component to such terms as pursuit, desire, and aversion. So how should I treat my emotional state during depression? My emotions are indifferent when they are not coupled with my opinions. This is completely my own thought, I can't back it up with Stoic quotes and such (maybe I'll be able to in the future). Still, look at this Aurelius quote: Today I have got out of all trouble, or rather I have cast out all trouble, for it was not outside, but within and in my opinions. Opinions come up a lot in Stoicism. This makes sense, opinions are formed by all the aspects of our mind that Stoics find important, like the will and reason. So the question becomes, where do my emotions meet my opinions? I believe that my depression arrives prior to my negative thoughts. By which I mean, my brain becomes chemically imbalanced and it makes happy thoughts oh so hard to generate while stressful thoughts flow like water on a downhill slope. As such, my emotional state would be indifferent, neither virtue nor vice. My emotions are simply part of the environment I find myself in. On the other hand, if I couple my emotions with my opinions, I am moved towards desire or aversion. In that case, my emotions become part of a process that is either virtuous or not. If this is a workable concept in Stoicism, then treating my depression as an indifferent should led to tranquility. I'm happy to report it did. Not instantly, but my depression lasted days, not weeks. It worked like this: One day I wake up and basically feel muted. The world is sepia, with all the emotional color drained out of it. Half a day later, I start the standard process of building my thoughts on a scaffolding of depressed emotions, leading to an even darker place. Thankfully, I have developed a habit of reviewing Stoic quotes and the like. I begin questioning the nature of my depression. I decide that my emotional state is outside my control. As such, I refuse to predicate my approach to the world on my present emotional state. I fulfill all my duties, listen to and accept good advice from my wife, surround myself with good friends, and basically continue life without paying attention to my dull internal world. Within 48-hours, my chemical imbalance corrects itself. This is record time. So that's what Stoicism did for me lately. I'm curious if other practicing Stoics have a different view of emotions and, if so, you'd be willing to share your wisdom. I'm always looking for a more stoic approach to Stoicism. Posted in stoicism and tagged with depression, stoic, stoic-saturday. November 5, 2011 by Matt V.
For we ought to have these two principles in readiness: that except the will nothing is good nor bad; and that we ought not to lead events, but to follow them. "My brother ought not to have behaved thus to me." No; but he will see to that: and, however he may behave, I will conduct myself toward him as I ought. For this is my own business: that belongs to another; no man can prevent this, the other thing can be hindered. This Stoic Saturday post will be short. I usually write them early but this weekend has been about enjoying time with my wife, going to a great Amanda Palmer show and, today, brewing an American Stout. This week I've been dwelling on principle one: Stoic morality. I think most people have run into Hamlet's version, "there's nothing either good or bad, but thinking makes it so." There's probably a difference between the stoic will and generalized thinking, but why nitpick? The point is, I've been working on internalizing the Stoic view of the world. In the Discourses, particularly in Book Three, Epictetus really pushes constant attention to principle one. Over and over, he asks his students to apply a simple rule to every situation, is this thing before me independent of the will, or dependent? If it's independent, he says to "throw it away." As I understand it, Epictetus is telling me to toss these things into the Indifferent category. That concept was covered well by Michael Daw in a recent post, I suggest checking it out. If something is dependent on the will, then I'm given a choice. Will I act with virtue, the only good? Or will I act out of vice, the only bad? This way of approaching situations is on the face of it, simple, and also very powerful. I find that performing stoic triage on events frees me to apply my energy towards fixable problems. I could say a lot about that, but I seriously need to start brewing. Happy Saturday, all. Posted in stoicism and tagged with stoic, stoic-saturday. October 29, 2011 by Matt V.
You ought when you are alone to call this condition tranquility and freedom, and to think yourself like the gods; and when you are with many, you ought not call it a crowd, nor trouble, nor uneasiness, but festival and assembly, and so accept all contentedly. This is a great weekend quote. I might go to dinner with my wife tonight, meet some friends, drink a few pints. I'll probably head over to 30th Street to do this. 30th is, after all, the best place to find good food and great beer in San Diego. Chances are a lot of other people will also be heading to 30th Street pubs this Saturday night. That said, am I going to get frustrated when I can't find a table right away? Will the bar be "too loud" for me? If so, whose fault would that be? Mine. What did I expect? Saturday evening crowds are predictable and few pubs employ the library "shhhh" against their patrons. So why enter a situation with expectations that are contrary to nature? What does that accomplish? I'm intentionally generating my own stress and decreasing my enjoyment of the night! So the smart move is either to not go to the pub, or to change my attitude. 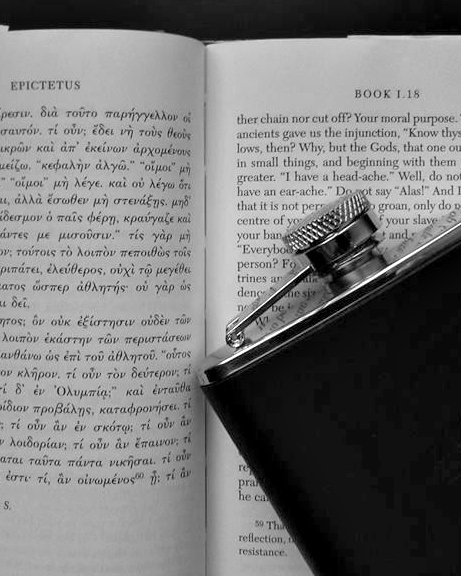 What I like about Epictetus (and all of Stoicism) is that he doesn't ask me to avoid the pub, or any other place, just because it might not perfectly suit me. Instead, I'm asked to revise my approach to the pub. It isn't the Saturday night crowd that's causing my stressful emotions, it's my opinion of that crowd. Why not enjoy the energy that's in the room? Why not accept that others can laugh loudly with their friends, wouldn't I laugh with mine? Sometimes we want to create a perfectly comfortable environment for ourselves. That's understandable. For instance, I love my apartment. It's filled with things I truly enjoy. But if my tranquility and joy are dependent on how much comfort my environment gives me, I'm going to live a small life. Stoicism encourages me to thrive everywhere, to find joy at all times. Tonight I might find it in a noisy pub...even before the beer kicks in. Posted in stoicism and tagged with 30th Street, san diego, stoic, stoic-saturday. October 22, 2011 by Matt V.
But if you suppose that only to be your own which is your own, and what belongs to others such as it really is, then no one will ever compel you or restrain you. Further, you will find fault with no one or accuse no one. You will do nothing against your will. No one will hurt you, you will have no enemies, and you will not be harmed. Epictetus claims I can become invincible. It's an appealing notion. I can't claim to be a fan of pain. Few people are. The thought of leaving stress, anxiety, and hurt behind me resonates with a comfort seeking self. There's a reason I don't go to the gym enough, and it isn't a love of body fat. I've been told I live in a culture of comfort. Perhaps, but it seems more reasonable to admit that I come from a species of comfort-seekers. Which is also to say, I am simply a living being. As I said, I'm not a fan of pain. However, I am a student of pain. Pain is the reason I never became a Buddhist. I respect much about that philosophy, but unlike Siddhartha I believe that pain is a feature, not a bug, in this universe. It is pain and struggle that shaped the world. Speciation exists because a billion habitats were not comfortable enough for a million billion stressed out ancestors of everything on this earth. So when Epictetus tells me to become impervious to my environment, I wonder if he's also asking me to cease developing. That's not my style. I remember the former me, a lot of them, and I always enjoy present me more. I figure by the time I'm 120 I'll be pretty damn fantastic. The thought of freezing into a mid-30s mindset is not very appealing. If I understand Epictetus, he equates control over things with ownership of those things. I find this reasonable. Possession is nine tenths of the law, and the other tenth involves me begging a more powerful force to get my bauble back. From that premise, Epictetus goes on to claim that I only own myself. Particularly, I only own my mental self. Notice that even my body isn't included in the ownership list. I accept this point as well. At present, my body is pretty much in sync with my mind. It does what I want it to do. If I were to talk to Michael J. Fox, however, we might have quite a conversation about the trustworthiness of the body. So here I am, saying that the only things I can effect with certainty are my own opinions of the world, my desires in the world (and the other side of the coin, my aversions) and my choice whether of not to pursue those desires. A final Epictetus quote, this one from the Discourses. I will show the nerves of a philosopher. "What nerves are these?" A desire never disappointed, an aversion which never falls on that which it would avoid, a proper pursuit, a diligent purpose, an assent which is not rash. These you shall see. The nerves of a philosopher. To show nerve, you need something to steel them against. So there is a struggle here. It's the struggle to be invincible. Epictetus is wrestling with himself. He grapples with his intellect, trying to force it to pay attention to the right things and dismiss the rest. The struggle is internal but it is about his approach to the external world. His imperviousness, after all, ends with an assent which is not rash. Stoicism engages with the world, but it refuses to struggle with it. Epictetus asks me to accept that I can't control my environment, but that I can control my reaction to it. Ideally, I will apply 100% effort towards only those things which I can control and in so doing I will act powerfully; free from fear, anger, and other burdens. Instead of struggling, I'm striving. The world can't wrestle me to the ground because I'm untouchable. Yet I'm still challenged to put one foot in front of the other to reach my goals. I will continue to develop under these terms. I can even thrive. I might not ever become invincible. I'm not sure Epictetus ever felt he got there either. Still, we can both agree that it's worth the effort. Posted in stoicism and tagged with Epictetus, stoic, stoic-saturday. October 15, 2011 by Matt V.
I do not bind myself to some particular one of the Stoic masters. I too have a right to form an opinion. I make a single claim concerning Stoicism. If I practice Stoicism diligently, I will flourish. That is the full extent of what I am willing to argue about my philosophy. The Stoics have made, do make, many claims. We live in a determined universe. Happiness is generated from within. We are kin to the gods! I am interested, often deeply, in the many topics that Stoics have addressed throughout the ages. However, those details are not the foundation on which I build my life philosophy. Stoicism allows me to flourish. It moves me to act, and to act well. In increasingly frequent moments the practice helps me capture joy, and when joy escapes me, there is still tranquility. I expect that you can have a similar experience. That if you choose to practice Stoicism diligently, you will flourish as well. That, however, is not part of my claim. I plan on writing about the practice of Stoicism. In particular, I plan on making Stoic Saturday a weekly event. All of my posts are Van Natta Stoicism. I mean to do well by the Stoics of the past and present, but my opinions are my own. I hope that what I write is applicable to others. I welcome conversation. But please, remember this disclaimer before taking me to task. Thanks. Posted in stoicism and tagged with Epictetus, musings, philosophy, stoic, stoic-saturday. October 12, 2011 by Matt V.
Every morning for the last month I've begun the day with these words from Marcus Aurelius. Today I will be meeting with interference, ingratitude, insolence, disloyalty, ill-will, and selfishness--all of them due to the offender's ignorance of what is good and what is evil. I came to modern Stoicism a few months ago, through the book A Guide to the Good Life: The Ancient Art of Stoic Joy. In it, author William Irvine makes a strong case that stoicism has much to offer the modern world. I don't believe the practice is for everyone. It fits best in an analytical mind and, in my opinion, particularly benefits those who have a touch of social anxiety. Stoicism is concerned with the internal and dismisses the external. Its central message may have best been described by Descartes, who must have cribbed heavily from the Stoic masters. Always to seek to conquer myself rather than fortune, to change my desires rather than the established order, and generally believe that nothing except our thoughts is wholly under our control, so that after we have done our best in external matters, what remains to be done is absolutely impossible, at least as far as we are concerned. I remember reading that quote over a decade ago and being upset by the phrase, to change my desires rather than the established order. At the time I could only imagine the worst forms of passivity deriving from such a creed. That is no longer a fear of mine. Stoics were passionate, world-changing types. When you are free from anxiety about the external world you are free to live out the world you want. I've been reading the Stoic essentials, mainly The Enchiridion and Meditations. I've enjoyed arguing with Epictetus, Aurelius, and Seneca. I've been looking for fellow stoics. I'm noticing that stoic teachings spring up a lot on the web. Unfortunately, stoicism tends to be one ingredient in most peoples' larger philosophy of life. I have found few people who use it as the core of their value system. No matter, stoicism delivers for me. I'll be posting about stoicism from time to time. I feel a bit duty-bound to share. There's just so little out there. I'd love to engage in dialogue concerning the practice. I'm on G+, Twitter and, of course, this very site. Also, if anyone knows the secret stoic handshake, teach it to me please. Posted in ramblings, stoicism and tagged with Aurelius, Epictetus, musings, philosophy, seneca, stoic. September 30, 2011 by Matt V.